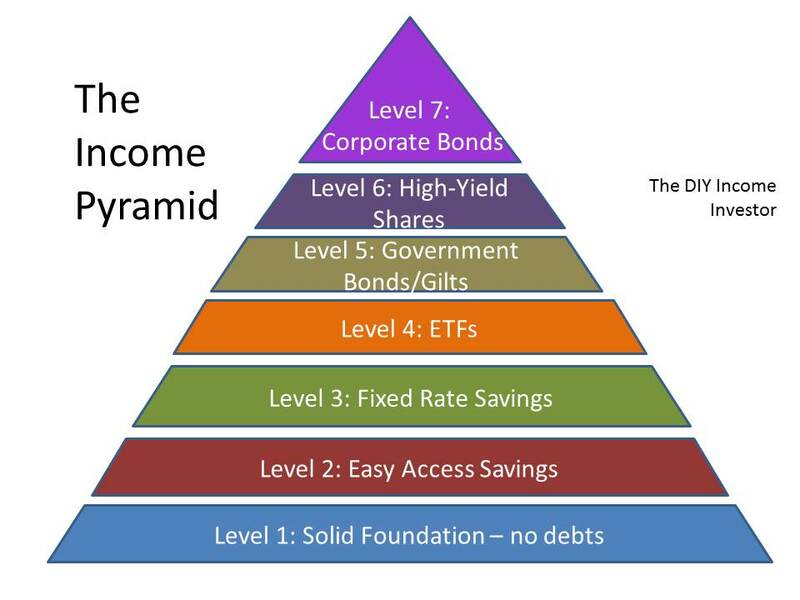 Developing the theme of the The DIY Income Investor, we finish building up your Income Pyramid by moving up to Level 7 - buying Corporate Debt, in the form of corporate bonds, preference shares and other similar securities (including, in the UK, Permanent Interest-Bearing Shares and Enhanced Capital Notes). These securities should sit preferably within a tax-shielded internet brokerage account. The DIY Income Investor approach is based on minimising risks (as far as possible) - so we suggest you do not engage in currency speculation - buy corporate bonds in your own currency (this will usually means bonds issued on a stock market in your home country). If interest rates fall, bond prices will rise and bond yields will fall and vice versa - the important figure to look at is therefore the running yield. The inital price (or 'face value') of a bond is call par – if you invest in a bond at issuance and hold it to redemption, you should receive its par value back. However, because a bond's price can vary during is life, you would suffer a loss on maturity if you bought above par (or vice versa). This is reflected in the redemption yield. The rate of return is relatively high. The coupon (interest rate) is invariably higher than any interest available from ordinary bank or building society savings accounts - mainly because companies (and recently banks) have always been considered slightly risky. Thus, the coupon offered by a bond will depend on how sound the company is perceived to be. Riskier companies have to pay more; solid ones pay less. The amount also varies according to prevailing bank interest rates, the date on which the bond issue matures and investor demand. The UK base rate is at an all-time low of 0.5% and will have to rise at some point. 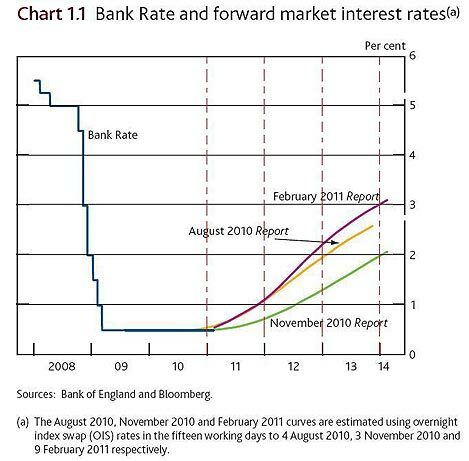 The Bank of England is battling higher than target inflation and that has brought forward the horizon for rate rises (as shown in the chart below). On the back of this, savings rates are already edging up and as base rate goes up they are likely to rise further. So returns that look good today may not look so fantastic in two years' time. If you buy now, and have to sell them off early, the market price could be substantially lower at that point. Bonds can act as good portfolio diversifiers for investors because they tend to perform differently from shares - i.e. there is a low correlation between the two types of asset. For example, when stock markets fell between 2000 and 2002, central banks cut interest rates to stimulate economic growth. In turn, bond investors enjoyed rising capital values, offsetting the losses on their equity holdings. How risky are corporate bonds? In one sense, bonds are usually a safer source of income than dividend shares, because the initial outlay is (usually) repaid and the coupon or interest is fixed from the start. However, if the company or bank issuing the bonds goes bankrupt, you will probably lose your money, as there are few safeguards for bond investors. 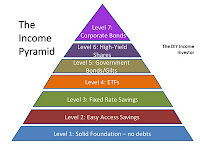 Bonds are rated according to the their issuing companies' financial strength. The main rating agencies are Fitch, Moody's and Standard & Poor's. The 'safest' corporate bonds are called 'investment-grade' – these are bonds rated BBB or above (by the rating agencies). Riskier bonds are known as junk bonds or high-yield bonds - these high-yield bonds pay out a higher level of income to reward investors for taking on higher risk. The main other risk is a potential change in the market price of the bond. Some investors may simply buy a bond issue on the day that it is launched and keep it until it matures, when the initial sum they invested is repaid - in this case, the price at which the bonds trade in-between is not important. But for those who want to buy or sell bonds after they have been launched (i.e. most of us), changes in price can make a big difference. The coupon offered by a corporate bond will depend on a number of factors, including the prevailing interest rate, inflation expectations and how sound the company is perceived to be. Riskier companies have to pay more; solid ones pay less. The amount also varies according to prevailing bank interest rates, the date on which the bond issue matures and investor demand (particularly of institutional investors). Changes in the price of a commercial bond depend on how long a bond has to maturity (known as duration). Each percentage point change in interest rates is magnified by the number of years to maturity. For example, a long-term 1% rise in interest rates would lead to a 5% rise in the value of a bond with five years left to maturity. The price at which bonds are traded also varies according to the market's views on inflation, interest rates, the economy and the continuing strength of the company itself. When the market is worried about inflation, rising interest rates or the company doing badly, the price of that company's bonds will fall. How do I buy a corporate bond? You will need a brokerage account (preferably tax-exempt or tax-shielded) - most accounts deal in most corporate bonds, although you should obviously check which are included before you sign up. How do I know which corporate bond to buy?